Android 9 is now available for all Pixel phones and is officially being christened Android Pie. This is the initial release of the OS and some of the features announced during Google I/O such as a Digital Wellbeing dashboard, and a revamped Do Not Disturb mode will be made available later. The final shipping version of Android 9.0 is now available and it's named Pie. That's right — no Popsicle, Pudding, or Pumpkin Pie — just Pie. Android 9.0 Pie is a significant update over Android 8.1 Oreo and is now rolling out to Google Pixel phones. Android 9.0 Pie comes with support for new iPhone X-esque gestures possibly to lure the iPhone X crowd to the Pixels but OEMs, and thereby users, can still choose the navigation system they like. The OS also gains native support for notched displays so that apps don't cut off important information. 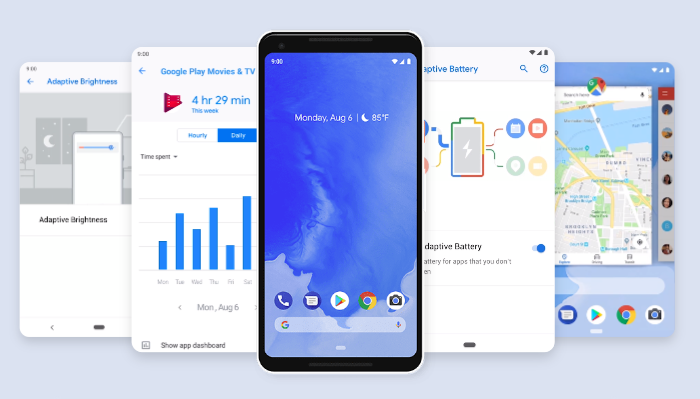 Android Pie comes with a new 'Adaptive Battery' feature that uses Machine Learning to improve battery life. This might already be a feature in some OEM ROMs but with Android Pie, ML-assisted battery life improvements are now a native OS feature. There is an increased focus on privacy as well. Background apps no longer can have constant access to the camera, microphone, or other sensors and an app has to explicitly request for Call Log access if needed. While the OS is technically feature complete as of now, not all Android Pie features have made it to this release. Features such as Slices that go a bit deeper to offer functionality that otherwise would require actually opening the app have not made the cut and are scheduled for a Fall debut. Slices can be very useful once it gains wide developer acceptance. For example, searching for 'Lyft' will not just show the app result but also throws up ride and fare estimates to work or home. Digital Wellbeing features that Google talked about during its Google I/O conference will be also be made available in the Fall. Pixel owners, however, can sign up for the beta to test drive these features right now. Devices that participated in the Beta program from Sony Mobile, Xiaomi, HMD Global, Oppo, Vivo, OnePlus, and Essential, as well as all qualifying Android One devices, will receive this update by the end of this fall! We are also working with a number of other partners to launch or upgrade devices to Android 9 this year." Phones that feature Project Treble should get the Android 9 Pie update considerable faster than Oreo, at least theoretically. Of course, timelines for OEM-skinned phones will differ greatly due to the underlying customization and additional device features.